Hunts Point usually figures into our imaginations with generally negative connotations; the prostitution that makes documentaries, high crime levels, and blocks dominated by faceless industry. Walking the neighborhood reveals more though, as colorful murals, some new parks overlooking the Bronx and East Rivers, and a few spots to eat here and there now vie for attention. One of these small restaurants is City Tamale, one of the only brick and mortar establishments you will see that focuses on this steamed masa dish eaten in México and throughout Latin America. They do provide walk-in breakfast and lunch service to local customers and always have a few options available, but it seems that a lot of their business is also done with small restaurants around the city. Five varieties are on the menu board, but the place is more than meets the eye. Ask which kinds they have available at the time you arrive and there may even be additional options not shown. 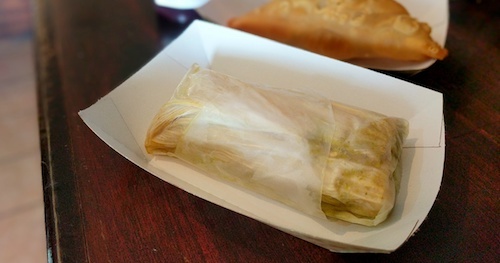 Tamales (below) are $2 each or 3 for $5. What also is not shown on the board is that they also make tacos, tostadas, and other Mexican antojitos here for lunch customers. All wrapped up and ready to go. 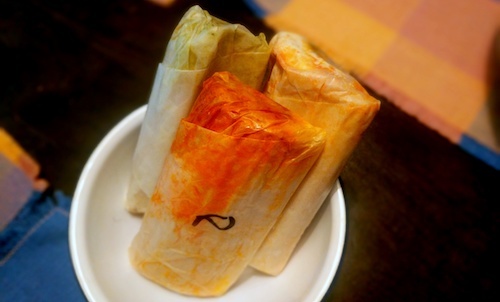 The tamal is such a wonderful invention, usually eaten for breakfast in México, and a stand-alone unit that has everything necessary already inside. 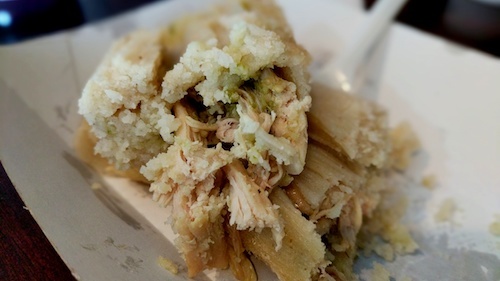 No silverware is needed, so one or more tamales can be picked up on the go and eaten relatively cleanly using the corn husks to hold everything. In Mexican neighborhoods throughout the city, tamal vendors are spread out on different blocks making it always easy to find one. The best normally sell out quite early in the morning. The version pictured above and below is the verde, full of shredded chicken and tomatillo salsa. It has a nice little kick and is moist and flavorful throughout. 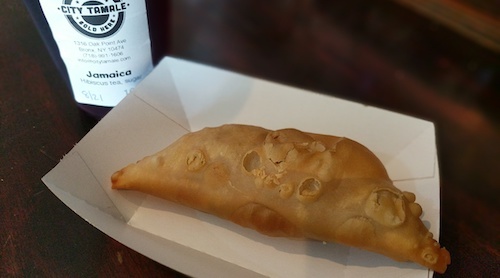 The shop also has empanadas ($1.50, below) that are light and fluffy. This version was full of beef and very tasty, a good excuse to use some of their homemade salsa. In addition to the verdes, City Tamale also advertises rojos, rajas, tinga, and dulce, all of which besides the sweet one we picked up for later consumption at home (below). All were of the same high quality and enjoyed equally. Housemade jamaica or fresh juices including sandia fresca, a watermelon drink are available as well as horchata and tamarindo. If you have time, take your food south to Barretto Point Park or north to Hunts Point Riverside Park to see some of the newest improvements made to the neighborhood. As seen in the top photo, the shop has a small pushcart and a street vending cart, which are not just for show. You can find them at a festival here and there, as well as Smorgasburg if you're lucky.